Daniel Bukin is a man of diverse musical talents. Conductor, composer, arranger, pianist, director, designer, you name it, he’s done it. His portfolio of compositions runs the gamut from solo piano and small chamber groups, to wind ensemble, orchestra, and opera. Some of his more eclectic pieces include an electro-acoustic work for wind quintet and tape, a short film entitled Enter, and even avant-garde musical called Spectrum, which was premiered as a staged reading in March 2015 at Appalachian State University in Boone, North Carolina. After two years of serving as Assistant Conductor, Daniel now leads as the music director and conductor of the Triad Area Medical Orchestra (TAMO), a community orchestra comprised primarily of medical professionals and students in the piedmont-triad area. He also serves as the Conducting Fellow for the Winston-Salem Symphony and is a member of ArtistCorps – ArtsEngage. 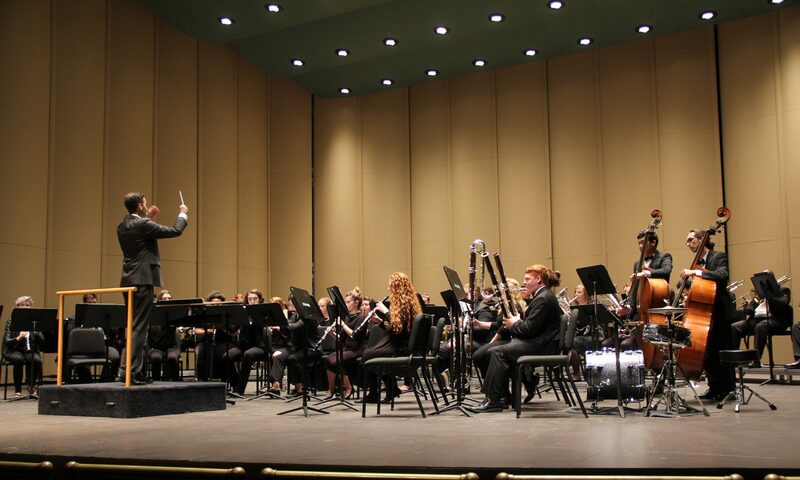 He has previously served as Guest Conductor of the UNCSA Wind Ensemble, and Assistant Conductor for both the UNCSA Symphony Orchestra and the A.J. Fletcher Opera Institute. Daniel has collaborated with musicians from around the world; participating in the Ithaca International Conducting Masterclass in Ithaca, New York, the International Institute for Conductors in Bacau, Romania, as well as the composition masterclass at the International Summer Academy of Music in Ochsenhausen, Germany. Daniel is an active composer and arranger and has collaborated with several ensembles including the Charlotte Symphony Orchestra, Charlotte Symphony Youth Orchestra, and Appalachian Video Game Ensemble. In conjunction with province workshops hosted by the fraternity Phi Mu Alpha Sinfonia, of which Daniel is a proud member, he has premiered arrangements for solo piano. Taking simple four-part TTBB songs and transforming them into a neo-romantic etude a la Rachmaninoff or Liszt. In addition to his love for classical music, Daniel is also deeply passionate about musical theatre. Most recently, he has worked with Winston-Salem Theatre Alliance as music director for their production of Blood Brothers and with Kernersville Little Theatre for their production of Route 66. Daniel has also had extensive experience performing as an actor, as well as working as a sound designer for many different theatrical productions. When he is not involved with any performances, Daniel loves to give the gift of music to the local community. Daniel has had the wonderful opportunity to work with Winston-Salem Industries for the Blind at their Summer Enrichment program for blind and visual-impaired children. He taught classes about world music, basic musicianship, and teamed up with the theatre program to put on a reduced version of the beloved musical, the Lion King. Daniel earned his Masters of Music in Orchestral Conducting from the University of North Carolina School of the Arts (UNCSA) in Winston-Salem, North Carolina where he studied with Christopher James Lees. Daniel earned his Bachelor of Arts in Music Performance: Music Theory/Composition concentration at Appalachian State University in Boone, North Carolina. He studied composition with Dr. Scott Meister and Dr. Ben Hjertmann, as well as piano with Dr. Bair Shagdaron. Daniel has served as assistant and/or cover conductor to Christopher James Lees, Leif Bjaland, Chris Allen, Brian Cole, Antony Walker, and Jessica Morel. Other conducting mentors include Jessica Morel, Mark Norman, Charles Gambetta, Ovidiu Balan, Larry Rachleff, Chris Kim, and Octavio Más-Arocas.